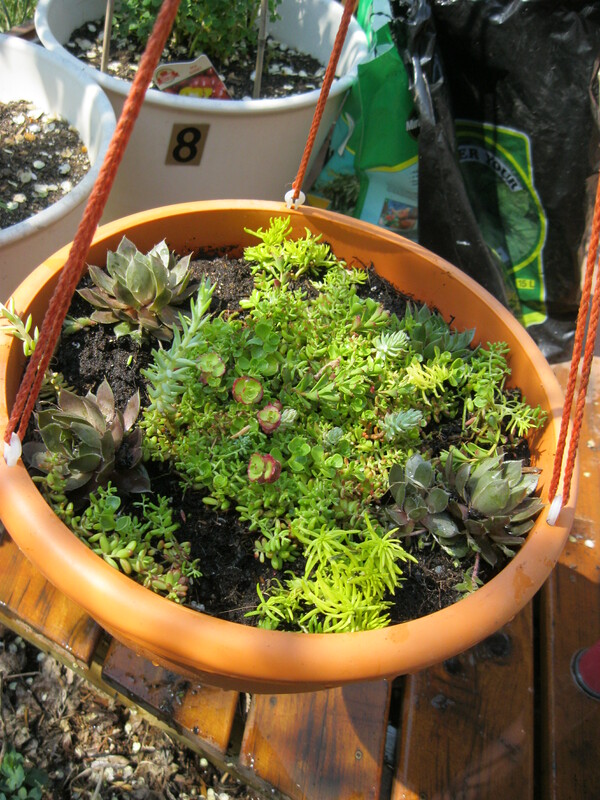 I didn’t overwinter my succulent pots (which fit into my outside table) properly and they mostly died. 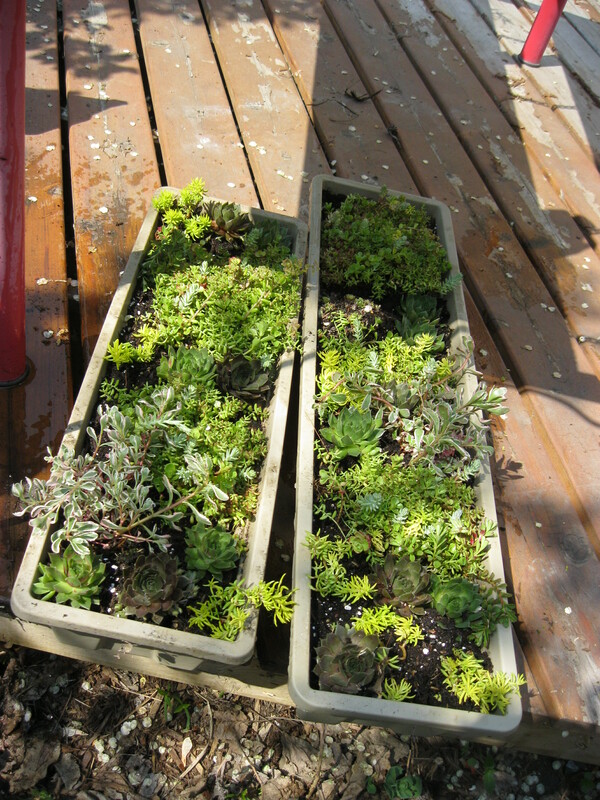 So I replanted them today, using one of these neat sedum tiles from Home Depot. They aren’t on their website, but I know they carry them there regularly because I bought one there last year too. With that, plus a few containers of plugs (three flats of plugs plus two loose plants), I planted my two table containers, plus an old strawberry pot and a hanging basket. One unfortunate thing about these succulent tiles is that I don’t think all the varieties are necessarily that hardy. I bought one last year, too, and used it to fill a miscellaneous pot that was on my deck (among other things). 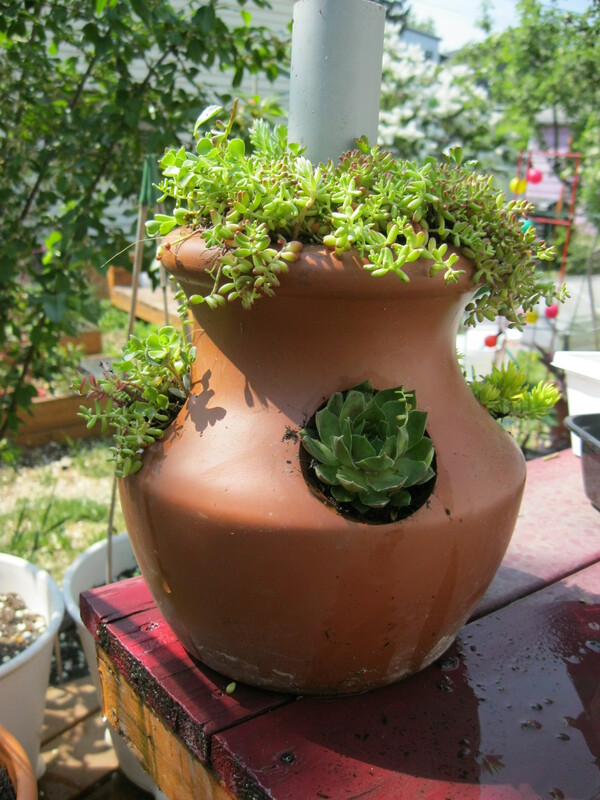 As of today, only one of the varieties in the pot survived the winter – like some kind of sedum Thunderdome (Sedumdome!). So, it still works but without quite the same joyful succulent je-ne-sais-quoi. I didn’t overwinter that pot properly either (noticing the pattern yet? ), so I’m going to try to treat these ones like the whiny, vulnerable babies they are and see if I can nurse them through the winter. Also, one of the possible applications for these tiles would be a super-easy way to establish a green roof. It would be easy (although not cheap) and would look good right from the get-go, unlike many green roofs that take awhile to get established. Also, the fact that they’re so densely planted means weeds would be almost non-existent. But if the varieties aren’t individually that hardy, this would be a recipe for sadness – since you have to assume that a high-up, exposed location is going to be a full zone colder (if not more) than a plant in the cozy, -30-degree ground. So I don’t recommend this, unless you are planning a green roof for your beach cabana somewhere in zone 6*. *If you are reading this, and you have a beach cabana, please email me. I want to be your friend. I’m not just being superficial. I really like you. The fact that you have a beach cabana is just an added bonus.